Home/Blog/How To Handle Size Deviation ? When the workpiece is machined, the control signal is sent to the servo drive device through the digital operation of the CNC system. The servo motor is driven and rotated by the mechanical feed device, and produce relative motion between the workpiece and the cutter, meanwhile the actual relative motion amount will be transformed into electric signal by location test feedback device to CNC device. 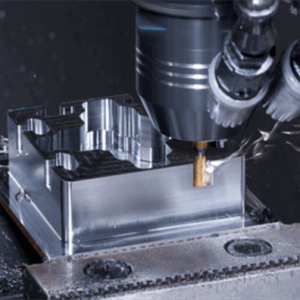 The CNC device compares the instruction transposition amount with actual transposition amount of the feedback, thereby processing the workpiece that meets the requirements of the machining program design. However, in the actual processing it often happens that workpiece and the tool is not completely in accordance with the command value of the relative movement, resulting in processing parts size and design does not match, which caused the occurrence of processing size deviation phenomenon. The actual transposition value of the servo motor coincides with the instruction transposition value, but the actual relative movement of the workpiece and the tool does not meet the requirements. The actual transposition value of the servo motor does not match the instruction transposition value. Machine tool transmission system return to zero position deviation. External interference or pulse loss and mechanical failure. CNC machining center is equipped with CNC control system and servo control system of electronic control devices, generally such systems have error compensation function, so the use of software compensation is the most direct and effective method to prevent and solve the processing size deviation. It includes tool compensation and interpolation algorithm. We know that CNC machining center numerical control system data value can only be a track of the starting point and the end point coordinates, therefore, between the starting point and the end point to do “data point densification” work, this process we call the interpolation algorithm. Through the interpolation algorithm, we can real-time control the tooling cutting trajectory in the entire process, the greatest degree of reduction due to some unpredictable reasons for the workpiece processing size caused by excessive impact. So as to achieve high precision machining of the workpiece, to reduce the impact of workpiece due to some unpredictable reasons, thereby to achieve high precision machining of the workpiece. Through the tool compensate to prevention size deviation is the most important means of compensation. However, to carry out tool compensation, first of all, we should estimate the before and after trajectory intersection type. For the straight line and the arc have four kinds of transfer form, including straight line and straight line, straight line and arc phase, arc and straight line and arc and arc connected. According to the difference between the vector angle of the two program trajectories and the direction of the tool compensation, the tool radius compensation of the program transition is divided into three transition modes: elongation type, shortening type and insertion type.